Are your manufacturing clients looking for additional planning, scheduling, and tracking solutions? Would you like to have a more competitive offering for targeting manufacturers? Then, consider US as your partner for Manufacturing Enhancements that work with Sage Software. Do your customers struggle with generating realistic manufacturing schedules? Do they have any easy visibility as to what products or jobs can be delivered when? Now there is a proven solution for these challenges that can be implemented in days. 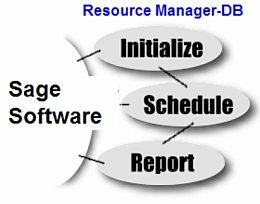 Featuring an easy connection to Sage Software, Resource Manager-DB (RMDB) is a scheduling system that is quick to implement, flexible, and simple to maintain. Your customers can finally achieve their goals of an affordable scheduling solution that quickly adapts to their needs. Analyze the resources (labor hours and workcenter loading) required to meet different demands. Resource Manager-DB adds value to the Sage Product Line with Finite Capacity Planning and Scheduling, as well as “What-If” analysis, and much more. Includes many advanced features such as: Skill Scheduling, Forward and Reverse directions, Multiple Constraints, Overtime, Priority, Lock Jobs, Pause Jobs, Alternate Workcenters & Routes & Theory of Constraints. With a single screen, the user can manage scheduling and rescheduling, (re) prioritizing jobs on demand and optimizing workcenter loadings through advanced features such as alternate routings, overtime, and minimizing cycle times. Resource Manager provides an easy alternative to add routings and shop scheduling to Peachtree and other Sage Solutions. With its unique adaptable design, Resource Manager can be configured to meet your customers’ specific needs, quickly and affordably. With Resource Manager-DB, you can add just what you need and only where you need it. If your customers have an immediate need for improved planning and scheduling, without high cost and complicated upkeep, we can help. Contact US today for more information about RMDB and our Business Partner Program. We look forward to the opportunity to work with you.